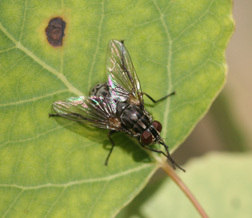 Stable Flies in Colorado usually feed on livestock. These flies are blood feeders; their bites are painful and produce swelling and itching as the result of injecting their saliva. Stable Flies feed during sunny, warm days and are most active during mid-morning and right before dusk. Biting seems to be worse right before a rain storm. Scientists say the biting will end when the night time temperatures begin to drop and kill the adult flies and larvae, which will be about the middle of October. The life cycle of a Stable Fly is about 3-4 weeks from egg to a mature adult. Adults live about 2 weeks. Females may lay several hundred eggs, and there may be 2 to 4 generations per year. The breeding habitat for Stable Flies is moist straw, hay, or grasses mixed with old horse (not cow!) manure. When the mixture dries out, the larvae die. Tiny parasitic wasps will lay their eggs in the manure mixture and their larvae will then feed on and kill the Stable Fly larvae. These wasps are normally found in our environment; however, there are not enough of them to control the Stable Flies. Wasp eggs hatch quicker than the Stable Fly eggs; however, a female fly can lay 3 times as many eggs as a female wasp. Wasps do not sting or bite humans or animals and may be purchased on the internet. 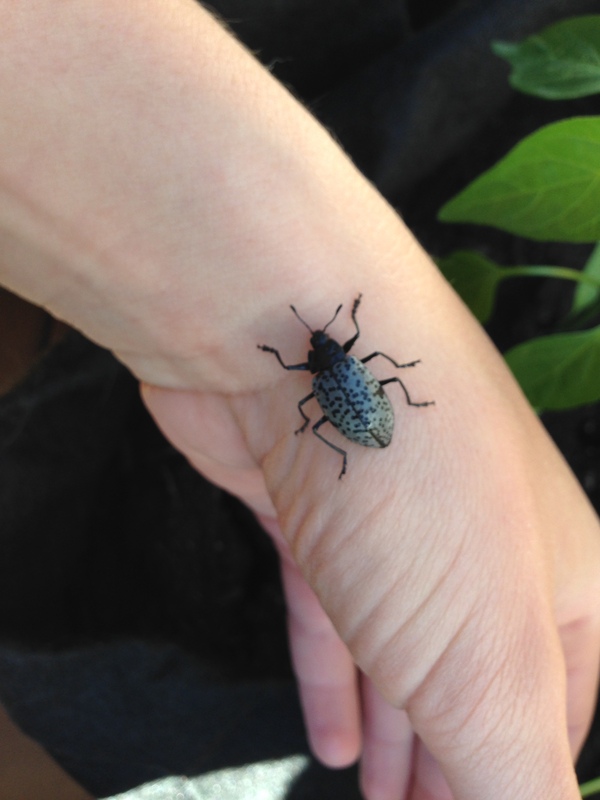 Fungus Beetles are described as harmless, so you may pick them up and handle them gently. These beetles loose their bright colors shortly after death. Fungus beetles are native to Colorado and are mostly found in woodlands with large trees. The best place to find these beetles is around bracket fungi that grow on rotting logs. Beetles over winter as adults and lay their eggs on rotting logs in the spring. 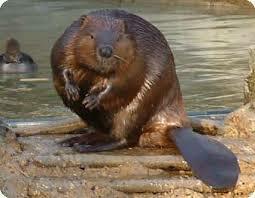 Beavers average between 3 to 4 feet in length, and weigh between 35 to 70 pounds. Beavers live in a family colony that can range from 4 to 8 individuals. The typical lifespan of a beaver is between 8 and 10 years. Females normally do not reproduce until they are 3 years old, and have a single litter each year with an average of 2 to 5 kits. Gestation period is about 15 weeks. Mating is monogamous and the adult female is the dominant family member and the leader of the colony. Beavers create their homes using natural materials such as tree limbs, mud, sticks, and grass to construct lodges for shelter and dams to impound water. Beavers need their ponds to be deep enough to hold water year-round and not freeze solid during the winter, usually a minimum of about 3 feet. Beavers feed on plants with non-woody stems, and the bark, buds, leaves, and branches of young aspen, cottonwood, and willow. Hummingbirds mi grate into Colorado late April and depart early September. The male birds will arrive about 3 weeks before the females to find a territory that will attract the females upon their arrival and will fight off other males for a good location. Hummingbirds in Colorado can weigh between 2.5 to 8.4g, and can flap their wings 53 times per second. Hummingbirds will eat up to 5 times their body weight every day and feed on flower nectar, insects and feeders. Many believe that they can live 3 to 4 years. Migration is a response to hormonal or chemical changes which are triggered by decreasing sunlight. Research shows that there is nothing we can do to make the hummingbirds stay too long and it is not necessary to stop feeding them to force them to fly south. They will begin to intensely feed several weeks before they migrate to gain weight. A female may add 25-40% more weight while the smaller male will nearly double their normal weight in order to survive the long flight. Hummingbirds may need to fly approximately 600 miles without re-fueling. It is estimated that it may take 22 hours to fly that distance, depending on whether they have headwinds to make the trip harder or tailwinds to make it easier. Hummingbirds do not migrate in flocks, they fly alone, they usually stay low to the ground, just above treetops, or skimming water. It is believed they fly this way to keep and eye out for insects or nectar during their journey and undetected by predators. Hummingbirds generally fly during the day and sleep at night, unless there is no place to land and they must keep going. Migration lasts anywhere from 1 to 4 weeks and the hummingbirds fly an average of 20 to 25 miles per day. Bears hibernate in the winter months, are most active between dusk and dawn, eat grasses, forbs (broadleaved plants), berries, insects, and newborn animals when vegetation is scarce. If you do see a bear, stay calm, do not run, make yourself look big, talk loudly and back away slowly. Hibernation dates will vary depending on the weather, but is usually from mid-late November to early-mid May. 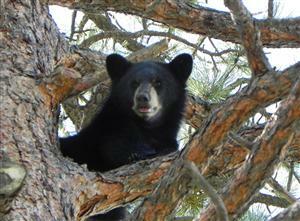 To discourage bears from being interested in what is on your property, do not leave pet food outside, clean BBQ grills thoroughly and store in a garage or shed after use, keep trash with food items in a bear resistant container or store in a garage or shed until the morning of pickup, bird feeders should be removed from April to November or hung so that a bear could not access it. Moose can weigh up to 1,100 pounds, can be 6 feet tall at the shoulder, and 9.5 feet long, making them the largest of the deer family. They have poor vision, however their excellent hearing and sense of smell more than make up for it. Moose can run up to 50 mph and are excellent swimmers. Moose graze on grasses, forbs, underwater vegetation, bushes, and willows. 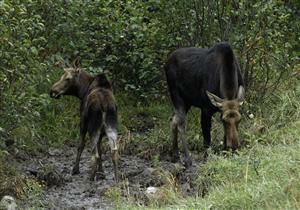 Moose are hard to spot as they have dark hides, do not roam in herds, and can easily hide in the willows and trees. Mountain lions do not hibernate, are most active at night, hunt for deer and small mammals, and can roam more than 20 miles to find food or mates. When a deer is killed, part of the meat is eaten and the rest is covered up with dirt or leaves until the lion returns to eat more. Lions will remain in the area until all the meat is eaten or spoiled which could take up to a week during the colder months. It is illegal to feed deer as it brings them into a neighborhood, attracting mountain lions and puts everyone at risk. In order to keep your pets safe, you should avoid leaving them out alone especially during the hours between sunset and sunrise. If you do see a mountain lion, stay calm, stand upright and try to appear larger by raising your arms and holding your jacket open wide, talk loudly and back away slowly. Do not approach a mountain lion, do not turn your back, and do not run. Canada Geese will find a mate and stay together for the rest of their lives, they are monogamous. They usually make their nest in an elevated area near water, such as on top of a beaver lodge. They lay their eggs in a shallow depression that they have lined with plants and feathers during the spring, March through May. There can be between 3 and 8 eggs, and will hatch between 24 to 28 days after being laid. 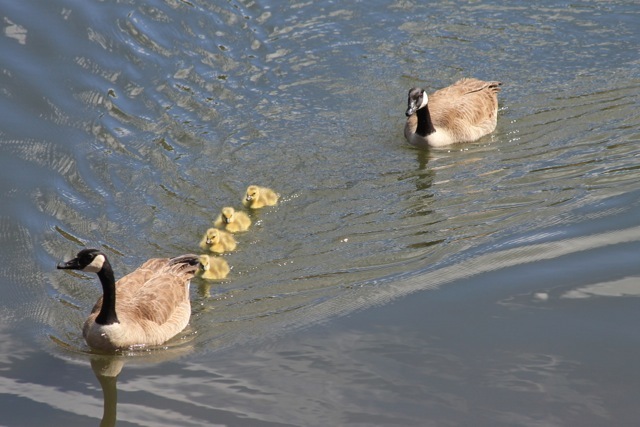 The female spends more time on the nest, and the male can be seen leading their goslings all in a row. The offspring will begin to fledge between 6 and 9 weeks of age.